We know it can be a little overwhelming to walk onto a church campus for the first time. To help you feel more comfortable here are a few notes to help you know what to expect on a Sunday morning at Rose Drive. First, come by our Guest Central Tent on the Sanctuary Patio and we’ll help you find your way around campus, check your children into our children’s ministry, and point you towards The Café (open 8:30-10:30 am) where you can grab a cup of coffee. Feel free to wear whatever you are comfortable in. You will find people dressed from their “Sunday best” all the way to blue jeans and a t-shirt. It doesn’t matter how you’re dressed; come as you are! What about my kids? We love kids, and we have a fun, safe place for your kids! Click on the links below to learn more about each of these ministries! What is a Sunday service like? Our services typically last about an hour and ten minutes. We have a Worship Leader who lead us with music that is excellent, contemporary and is centered around our core belief in who Jesus is. The messages are engaging and delivered by one of our Teaching Team members who will share about God and life from the Bible; that will challenge and encourage you to think, ask questions, and grow in your journey of faith in Christ. We also talk about ways to get connect to the community life that is happening at Rose Drive and have an opportunity to give for those who call Rose Drive their home church. 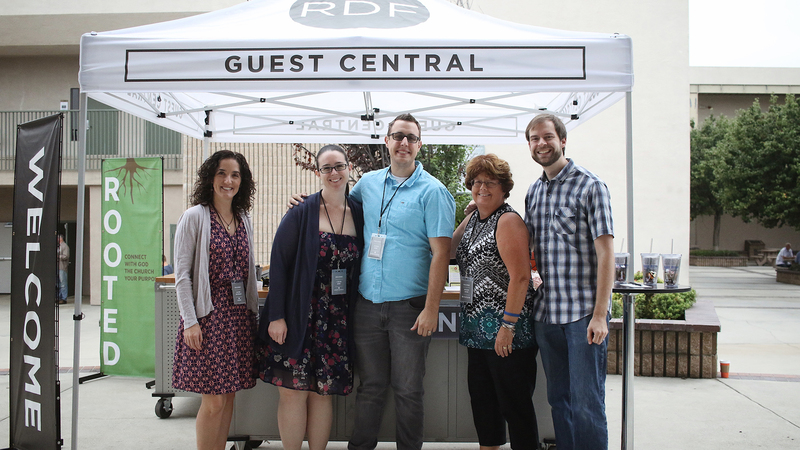 If you are a guest with us, be sure to fill out an “NEW TO RDF” card and bring it to the Guest Central Tent – we would love the opportunity to meet you and answer any questions you might have. And, please do not feel obligated to give in the offering as a guest. Where do I find more info? Feel free to browse around our website for more information. You can also email us (info@rdf.org) or visit the Guest Central Tent on Sunday mornings.